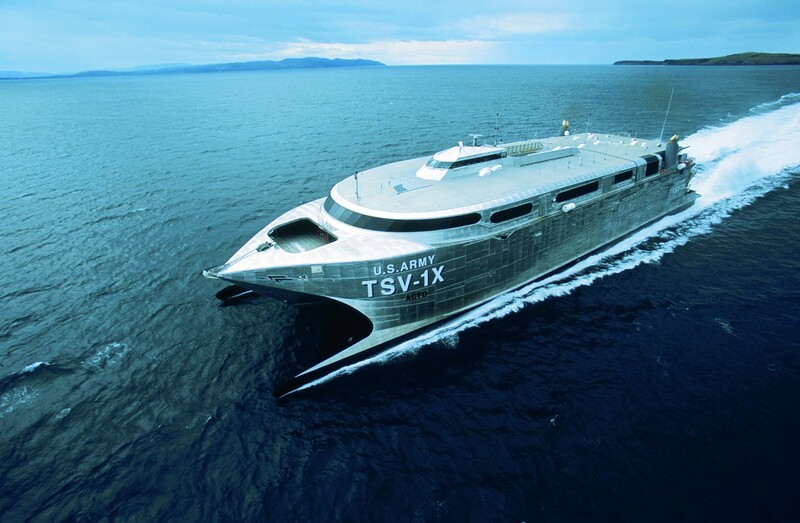 In a Pre-Solicitation Notice issued on 30 August 2002, the United States Department of the Army announced its intention to acquire a second Incat-built high speed Wave Piercing Catamaran for Theater Support Vessel (TSV) evaluation in various mission scenarios. As part of the US Defense Department’s Advanced Concept Technology Demonstrator program (ACTD) the purpose of the TSV was to demonstrate and evaluate its ability to perform during certain mission scenarios, assess its usefulness to the US military and refine the requirements for the next generation of army watercraft and the objective TSV. It would also be evaluated in its intra-theater role in support of Operation Enduring Freedom. 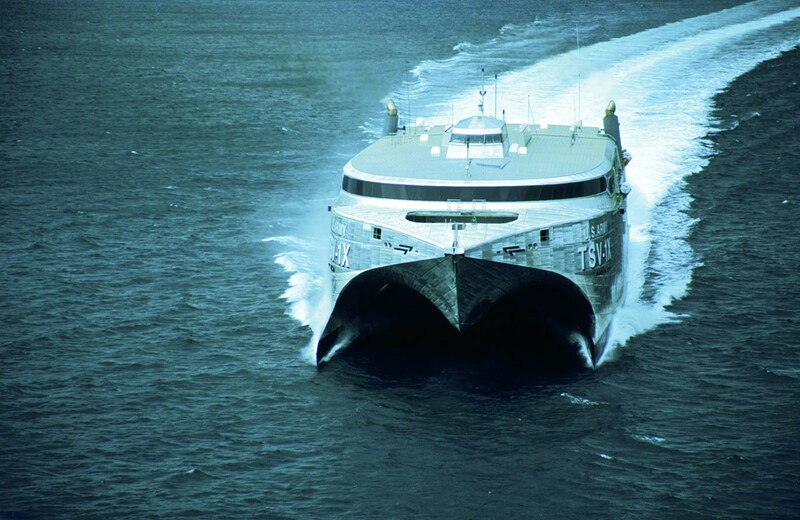 One month later, on 30 September 2002, the US Army announced the signing of a contract for a second Incat-built high speed Wave Piercing Catamaran. The Incat team in Hobart swung into action converting an almost complete newbuild 98 metre vehicle-passenger ferry, Incat Hull 060 for its military role, a task with delivery targeted for one month after contract award. Unlike their commercial counterparts, this catamaran, to be named TSV-1X Spearhead, would not enjoy the luxury of having dedicated shore-side linkspans available to load and discharge their cargoes. To this end, an aluminium folding ramp was fitted to the stern starboard quarter. Fitting ramps to vessels is nothing new and Incat had previous experience with designing and fitting ramps capable of carrying heavy transport vehicles of over 45 tonnes and axle loads of 10 tonnes as shore based or attached to the craft. However, ramps on military vessels are required to accommodate more than the average highway mix of traffic and this ramp had to offer a capacity of 65 tonnes for tracked vehicles, (up to and including the Abrams Battle Tank – M1A2) and any other vehicle up to that mass. It also had to be used at a pier, either alongside or directly astern of the ship. To achieve this, an innovative rotating turntable, to which the ramp was fitted, was installed at the starboard quarter. 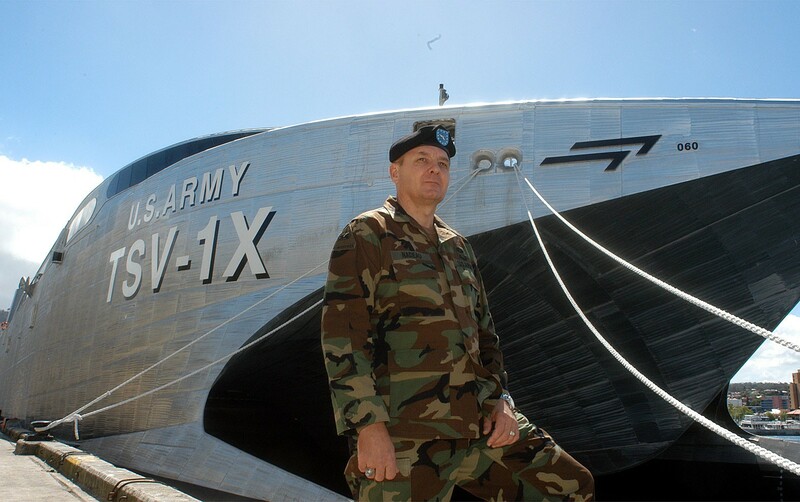 On 14 November 2002 the US Army accepted Incat Hull 060 – its first Theater Support Vessel; TSV-1X, United States Army Vessel, Spearhead, Advanced Concept Technology Demonstrator. Despite the fact that the Bollinger/Incat vessels were supposed to be in the test and evaluation phase, that did not stop the Pentagon from rushing them to the Persian Gulf to participate in the fight to dislodge Saddam Hussein’s regime from Iraq. In support of Operation Iraqi Freedom, both – TSV-1X Spearhead and HSV X1 Joint Venture were pressed into service on missions to maximise their speed and flexibility, being required for sustainment deliveries, the movement of Army prepositioned stocks and troop transport. It was in this role that the design solidified its reputation with the Army. Leaving Hobart soon after handover TSV-1X Spearhead headed directly to the Persian Gulf to be part of the major military build-up in the region. En route her crew began training, conducted extensive sea trials and outfitted TSV-1X Spearhead for logistics operations worldwide. At the end of her first year in operation TSV-1X Spearhead returned to her Hobart birthplace in November 2003 for a scheduled and well earned annual overhaul. Since leaving Hobart in December 2002 the vessel had logged more than 50,000 nautical miles prior to departing the Gulf on her return voyage to Tasmanian shores. TSV-1X Spearhead’s missions included hauling two Patriot missile battalions from Qatar to the Kuwaiti naval base. She also moved the 101st Airborne Division military police from Djibouti to Kuwait, making the 2,000-mile trip in two and a half days. The craft’s predecessor, the LSV, would have needed 10 days to make the voyage and would only have accommodated the equipment, requiring the troops to fly separately. Speaking of TSV-1X Spearhead’s performance in that first year Commanding Officer Patrick May, said even he had been surprised by the craft’s capabilities. “We were new to TSV-1X Spearhead and didn’t know what its capabilities were. We pushed it to the absolute max, sometimes over the edge, and she never let us down. “Before TSV-1X Spearhead, a commander would have to fly his troops from one location to another and then have his equipment moved by different means. Traditionally, our fleet moves at 10 knots: we move fully loaded at 40-plus knots. “Everyone we supported fell in love with the asset and its capability. As far as the future, we are standing on it. This is the future,” Cdr May said. Because these vessels were Commercial off-the-shelf, or COTS, they were made ready for US military use relatively quickly. With two ships leased and tested the US Defense Department proceeded to charter a third and HSV-2 Swift was delivered on 12 August 2003. Late in 2005, the US Army Tank-Automotive and Armaments Command concluded its three year charter of TSV-1X Spearhead from Bollinger / Incat USA, LLC. The US Army was warmly congratulated by Bollinger / Incat for having the foresight and vision to assess the high speed platform and its usefulness to the US Military and refine the requirements for the next generation of intra-theatre roles for future watercraft. The TSV is a truly transformational capability that enhances Army and joint deployment, employment, and sustainment. As a result of these experiments the Marine Corps now requires a high-speed connector to support expeditionary manoeuvre warfare doctrine and ship-to-objective manoeuvre operations. The US Navy’s Transformational Roadmap for Seabasing also demands high-speed, shallow-draft vessels. After her well documented career with the US Army, TSV-1X Spearhead was purchased from Bollinger / Incat LLC by the government of Trinidad & Tobago, and re-branded. T&T Spirit. Emerging from her refit at Incat’s Hobart shipyard sporting a new white hull along with the Trinidad & Tobago national colours of red, white and black on its sides, T&T Spirit joined Incat 91 metre vessel T&T Express on the 85 nautical mile crossing between Port of Spain and Scarborough.